Rachael Ray has agreed to shill a multi-million dollar marketing campaign designed to raise brand awareness of Dunkin' Donuts. Very soon, you'll see her perky face all over TV as she cheerfully chirps nonsense about how Dunkin' Donuts can be a "healthful" addition to a balanced diet. Our spies tell us that food-loving Rach is planning a donut-themed cookbook to hit the shelves this summer. You'll find healthy and fun donut recipes for everything from appetizers to drinks to full-course dinners....all easily prepared in only 15 minutes. Medium: acrylic on board, photoshop. Also included with the book is a handy set of full-color recipe cards for her most popular dishes. 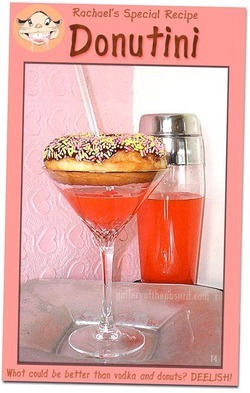 Learn how to make Rachael's signature cocktail, the vodka Donutini. 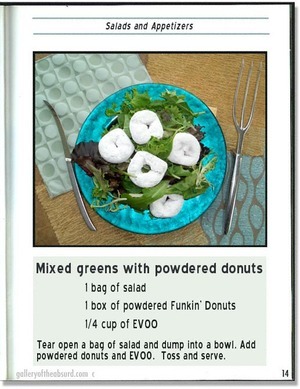 Amaze and delight your friends with Rachael's deelish Donut "Sammy"
That crafty Rachael, she's even figured out how to prepare a healthy salad using powdered donuts as an ingredient. This page scanned from her upcoming cook book shows you just how easy and delicious her recipes are. As Rachael says, "mmmmmmmmmm". 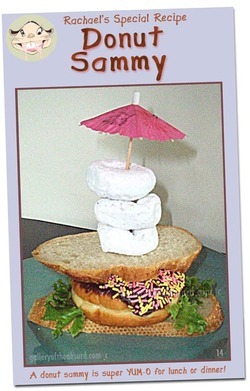 Photos and food styling by 14. Hey kids, get your "Daddy Dearest" Talking Dolls before they sell out! Alec Baldwin recently suffered the sting of humiliation after an angry voice mail tirade he left to his daughter was made public. Toy makers quickly scrambled to create a talking doll based on the "bitter dad" phenomenon and recently launched the Alec Baldwin Daddy Dearest Talking Doll. Pull Daddy Dearest's string and prepare to be shocked over the profanities escaping from his mouth. Each time you pull the string, you'll marvel at how Daddy Dearest begins to redden as he trembles with livid anger. Wait a few seconds and hear him start yelling at the top of his lungs! Daddy Dearest is sure to be at the top of every kid's wish list. Medium: graphite on paper, digital color, paint, sage. Francisco Goya (1746-1828) is often called the "father of modern art" and remains one of Spain's most important artists. A superb portraitist and skilled printmaker, Goya's set of 80 etchings called Los Caprichos is among some of his finest work. Inspired by his observation and critique of human foibles during the tumultuous era of late 18th century Spanish society, Los Caprichos is a series of dark satire filled with monsterous and foolish characters. If Goya were around today, I wonder what his take on celebrity gossip would be? All I know is that I saw this photo of Janice Dickinson crouching on the sidewalk and was overcome with cold fear tempered with gut-busting amusement. Medium: ink on paper. Much thanks to Miguel in Madrid for the translation. 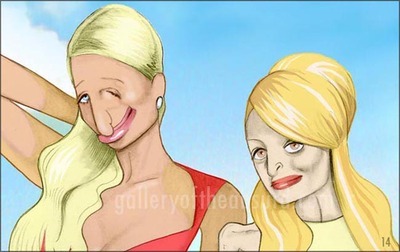 Paris Hilton vs. Gallery of the Absurd? By now you might have heard I received a letter from Paris Hilton's attorney asking me to remove the parody of The Simple Life Goes to Camp from my blog. At first, I thought the letter was from a prankster. I laughed and then ignored it. I wrote to Michael K over at Dlisted to tell him about it and he said he received the same letter and that it was legit. I became extremely perplexed...how could my idiotic parody do any more harm to Paris Hilton's reputation than she's already done to herself? I asked her attorney this question and it pretty much boiled down to the fact that I added freshwater crabs to the side of the boat. Apparently, the presence of semi-terrestrial crustaceans imply that Paris has a "loathsome disease". I removed the little buggers as instructed. As I've stated before, the illustrations on this site are born from the social commentary generated by celebrity gossip. The truth is, I'm not inspired by Paris Hilton herself, I'm inspired by you. Your blogs, your message boards, your comments, and your tabloids are what spark my ideas and amusement. The opinions we have about Paris Hilton are much more entertaining than Paris Hilton herself. There are countless references to Paris Hilton's alleged crabs to be found all over the internet and I had chosen to add that particular element to the parody. 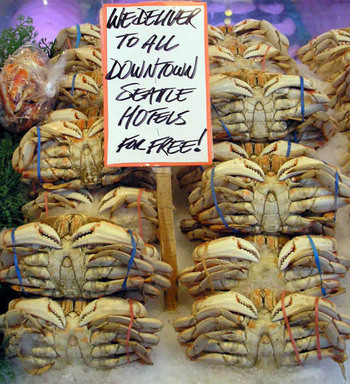 I don't have the the huge amount of cash needed to fight Paris Hilton over this, so it's much more affordable just to make the crabs disappear. I won't stop painting Paris Hilton though. Nope, as long as people talk about her, I'll continue. With that said, thank you very much for your support and encouragement. Crab photo taken by Kipling West. My talented pal gilmore from Pretty on the Outside made this for me to show his support. I was so touched and amused by his kind gesture that I had to post it. Thank you g! People are now sending me their creative interpretations of this silly debacle. We've obtained the exclusive image of the Simple Life Goes To Camp promo poster before it was heavily altered in Photoshop. According to a source, problems plagued the set. Paris Hilton kept flashing her privates because she thought the film crew was the paparazzi. Originally, Brandon Greasy Bear Davis was hired to carry the boat over the water, but a pack of orphaned bear cubs kept following him and he had to be removed from the photo. Tinkerbell threw herself overboard in a final attempt to escape from Paris's clutches. Paris didn't notice her dog was missing until several days later. Medium: ink on paper, digital color. 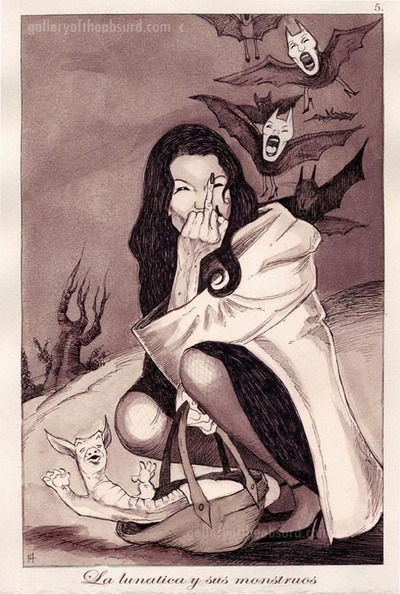 Yes, there's an uncensored version of this illustration and it's painted in horrifying detail. Photo retouchers had to smooth over Nicole Richie's gaunt face and worked long hours fixing Paris Hilton's "wonky eye"
Brandon Davis sweated profusely during the photoshoot giving him a slippery grasp. Thinking Brandon was their long lost mother, hungry bear cub orphans followed and suckled at him as he carried the boat through the water. The EPA had to be called because a strange oil slick was found in the lake after Mr. Davis emerged from the water.